Easy to make and delicious to eat. Heat a oil in a handi and fry onion when it turns into golden brown then turn out in a dish and keep aside. 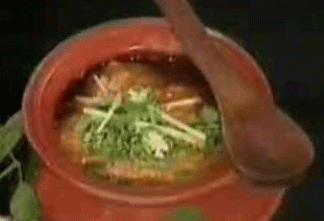 In same oil, add ginger garlic paste,salt,red chillie powder and garam masala powder and chicken, stir it very well. Now add tomatoes and stir when tomatoes are tenderd then add yogurt and cook it very well. Add fried and mashed onion and stir it till oil separates. In last add green chillies and cover it with lid for 5 minutes. Serve with naan and salad. No turmeric in this recipe? I always say sometime few ingredients give the best taste. thanks Slama. This is a nice and simple recipe Salma jee. Thanks.